Flies are one of the most annoying pests that can be found in UK homes and business'. Some species are more common than others but all flies are known to harbour and carry diseases. 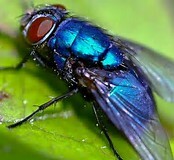 House Flies - House flies are major carriers of diseases. Adults are between 6-7mm in length and the females are usually larger than the males. They are grey in colour with a buff or yellow abdomen. They have complex compound eyes with thousands of lenses that allow them a wide field of vision. Blue Bottle Flies - Blue Bottle flies are also known as Blow Flies. Their name derives from their iridescent blue colour that is similar to coloured bottles. Adults are between 1/4 - 1/2" in length. Green Bottle Flies - Green Bottle flies are also known as Blow Flies. Their name derives from their iridescent green colour. Adults are between 1/4 - 1/2" in length. Cluster Flies - Cluster Flies or Attic Flies, are named due to their habit of forming 'clusters' when hibernating and are usually found in roof spaces and attics. There are several species found in the UK but they are often found in mixed swarms. Sizes vary between species from around 6mm - 10mm. They are slightly larger than the house fly and appear to fly more sluggishly. 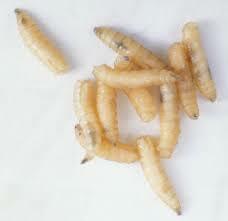 Fruit Flies -are also known as Vinegar Flies or Sewer Flies. Adults are about 1/8" in length. The front portion of the body is tan and the rear portion is black and they typically have red eyes. 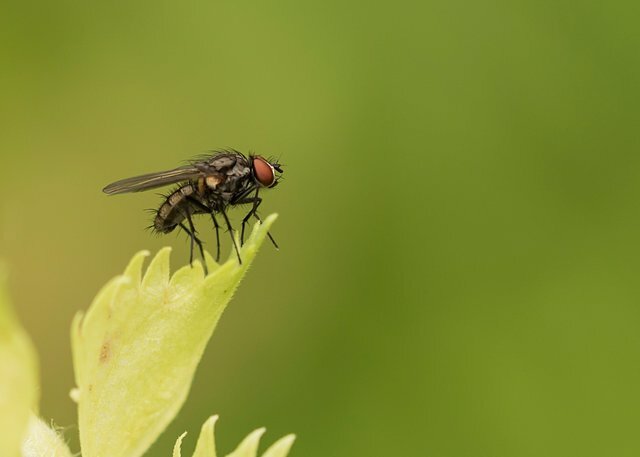 House Flies - House flies are attracted to all types of food including human food, animal feed, pet foods, food waste and faeces. House flies can infest all types of premises. Blue Bottle Flies - Blue Bottle Flies can often be seen flying around rubbish bins and are attracted to decaying matter, faeces and dead animals. Seeing adult flies is usually the most common sign of activity but larvae may also be seen as they crawl out of breeding material to pupate. Green Bottle Flies - Green Bottle Flies are classified as filth feeders that develop in and feed dead animals, faeces, rubbish and decomposing matter. 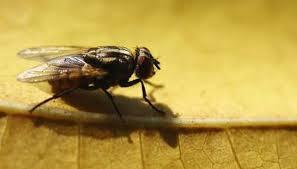 Seeing adult flies is usually the most common sign of activity. Cluster Flies - Cluster Flies form 'clusters' when hibernating and are usually found in roof spaces and attics. They live outdoors during the summer months but as autumn approaches they seek out a protected site to spend the winter. They can often ne found in vast numbers in attic spaces. Fruit Flies - Also known as Vinegar Flies and Sewer Flies can be a problem all year round but are more noticeable during the summer. They seek out and are attracted to ripe and rotting fruit and vegetables. Once located they lay eggs on the surface of the food matter. Fruit Flies will also breed in drains, rubbish disposals, bins, mops and cleaning rags. How serious is a fly infestation? House flies are major carriers of diseases. Diseases are carried on their legs and the small hairs that cover their bodies, transferring pathogens to food and surfaces in a matter of seconds. Diseases carried by house flies include, Salmonella, Typhoid, Dysentery, and Tuberculosis. House Flies have also been known to transmit the eggs of parasitic worms. Blue Bottle Flies are known to be carriers of diseases such as E-Coli, Typhoid, Dysentery, Staphylococcus, Streptococcus amongst many others. One female Blue Bottle can lay up to 600 eggs resulting in a very rapid infestation. 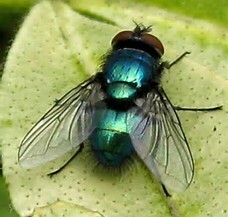 Green Bottle Flies are known to be carriers and transmit pathogenic micro organisms that include Dysentery, Salmonella, Typhoid, E-Coli and many others as a result of the contact they have with faeces and dead animal matter. Cluster flies are classed as a pest due to the very large numbers that cluster together. Once a cluster of flies has found a suitable habitat they emit a pheromone which attracts others. If the clusters are large enough to detect the pheromone they have been known to return year after year in greater numbers. Fruit Flies have significant capacity to spread disease through viruses, bacteria and moulds. Despite this they are not thought to be a risk to human health. Fruit Flies are considered to be an undesirable nuisance pest. Can I resolve a fly problem myself? Due to the very rapid rate of reproduction fly infestations can take hold very quickly. Knowledge and experience are needed to tackle the problem quickly and efficiently. Although there are products available, a professional pest control company will have access to licensed, professional only use tools and products that are not available to the general public. 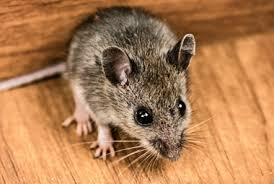 Therefore it is advisable to contact a professional pest control company. On completion of the inspection and an assessment of the situation, the technician will recommend the best cause of action to resolve the fly problem. Our technician will use the best tools and professional use products to treat the fly problem. Our knowledgeable technician will offer advice and solutions to prevent further fly problems from reoccurring. No, you don't need to do anything at all. Our professional technician will ensure that our service is carried out quickly and safely, ensuring peace of mind for you and your family or business.